Looking for a Koli band and a ghodi service for the baarat? Want a bit of bhangra tadka, Gujarati garba or retro Bollywood tunes at the wedding? Gurudatt can provide all of these and more for your wedding festivities — from safas and buggis, to lighting and jhoomar batti. Additional rental details: Price for ghodi is Rs. 3,500 per event; price for a basic safa is Rs. 80 per person; price for buggi with 2 horses and without lighting is Rs. 8,000; price for buggi with 2 horses and lighting is Rs. 10,000. 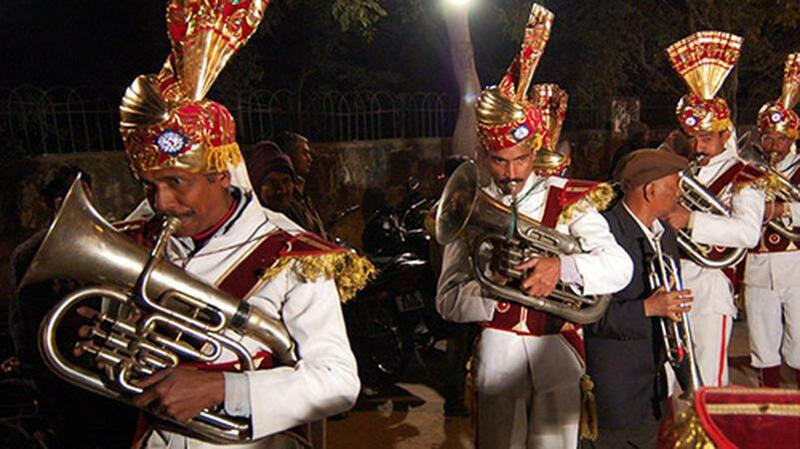 Gurudatt Band is a brass band based out of Mumbai . Gurudatt Band's telephone number is 76-66-77-88-99, address is Versova, Andheri (W), Mumbai. Gurudatt Band is mainly known for Wedding Brass Band, Band Baaja, Safa, Dhol, Baraat Services.. In terms of pricing Gurudatt Band offers various packages starting at Rs 8000/-. There are 0 albums here at Weddingz -- suggest you have a look. Call weddingz.in to book Gurudatt Band at guaranteed prices and with peace of mind.